When I heard this story on the morning news I actually thought I had heard wrong. 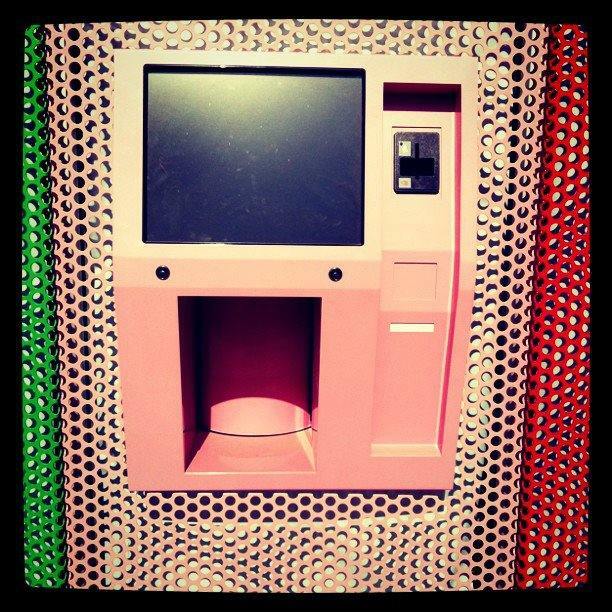 Maybe this atm of sorts could print vouchers for you to skip the lines at go straight to the cupcake counter? Maybe it printed cupcake-flavoured stickers? But how can an atm produce a fresh, tasty cupcake 24/7? While the how hasn’t exactly been figured out, Sprinkles (the ultra-famous LA cupcake shop) is planning to launch a cupcake vending machine. Because the launch date hasn’t been released and Sprinkles’ Facebook page is the authority on this news story, the logistics are unclear. One thing is for sure, the vending machine will be pink. Another thing that’s up in the air are my emotions regarding receiving a piece of dessert from a hunking piece of metal hanging out on the street corner. I believe the bakery experience (the smells, especially) are an essential part of my $4.00 cupcake buying experience. But perhaps I’m in the minority on this, as Facebook posts in general revere this move with feelings of euphoria. And there are other crazy vending machine ideas out there (although I’ve used any, and maybe haven’t ever encountered any of the strangest) including vending machines that sell electronics, retail goods and even birth control pills, fresh-baked pizza, recycled items and butcher meat. A machine being developed by Kraft that has facial screening technology will sell products only to adults. Oh the world we live in!